Monday and Thursdays are trash pick-up days in our neighborhood in Queens, NY. Thursdays are also recycling pick-up days. 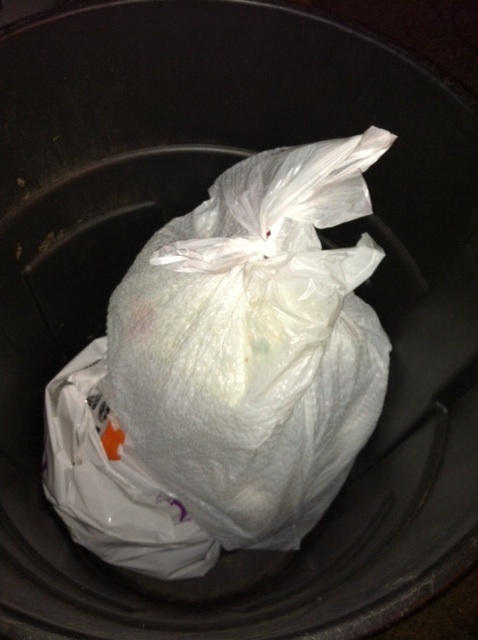 Last night we put out one bin with one bag of trash from the house, and the small bag of litterbug trash I collected from our yard on Tuesday. 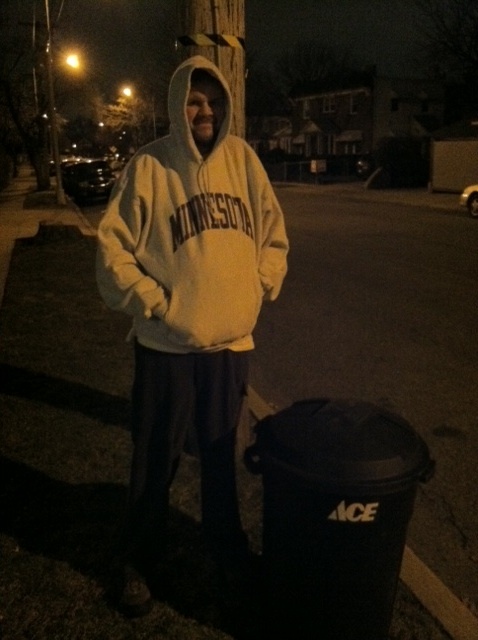 That’s my husband taking out the trash – smile Steve! Total trash weight: 8 lbs. No recyclables to put out this week. This entry was posted in The Rubbish Diet and tagged The Rubbish Diet, trash. Bookmark the permalink. So, I’ve often wondered if anyone has looked into the trade-offs that exist in washing the K-cup filters. We have the filter for the Keurig, and it is quite the pain to use (we use the filter for tea, and still use the evil K-cups). The coffee isn’t as good in a filter (although it is far from bad), but to clean up the filter takes A LOT of water! I realize that your goal is to get your waste stream to near zero, but at what costs? If it takes several gallons of water to wash out a filter, in the overall scheme of preserving the planet, which is worse? Extra waste, or wasted water? Very good point Pete. Every choice we make from an ‘environmental’ stand point will involve trade-offs and compromise. You can often make the argument for both sides depending on the factors you take into consideration. What if we took electricity usage into consideration? Does the Keurig use less electricity than a conventional electric coffee pot? Even if I use a french press for my coffee I have to boil water and wash it out – all using resources. You can even take the externalities into account. How much emissions are produced by the trucks that take my trash to a landfill? How many resources are used in bringing the coffee beans to my house in the first place?